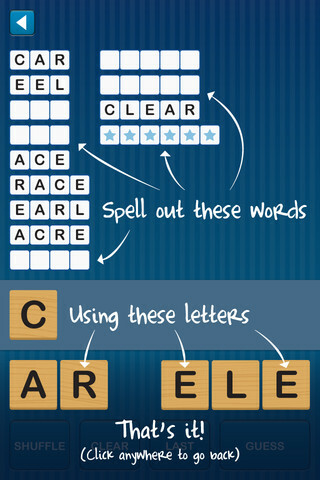 The full name of this app is Anagram Twist - Jumble and Unscramble Text. As the name suggests, it's a word game where you need to use the given letters to create new words. What I like: I suspect Anagram Twist began life as an iPhone app, and has been made compatible with iPad. I believe this works in children's favour. The game interface is clear and uncluttered, with letters given in large "wooden" upper-case tiles. (Helpful for Book Chooks who've misplaced their glasses!) I also like that there are a couple of ways to arrange letters - kids can tap on a letter or drag it into place. There's a shuffle and clear button, and there's no time limit, making game play relaxing. You can play the game for free, but pay to unlock extra puzzles. However, there is no option I could find to reveal unguessed words. This could be frustrating for some kids, and means a learning opportunity is missed. I would still recommend Anagram Twist as a game for the whole family to play. It's the sort of game I see Grandma and Billy playing together. Grandma can help with longer words perhaps, while Billy tries consonant-vowel-consonant clusters. I love that kids like Billy will practise spelling and develop phonic awareness without realising it. While children will naturally be more attracted to games with bells, whistles and zombies, smart parents can use games like Anagram Twist to put some fun into learning time.